How Much Will Climate Chnage Cost Coastal Cities? Global damage from flooding could cost coastal cities as much as US$1 trillion per year — and developing countries will be hardest hit, a study warns. 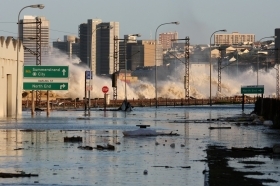 According to the paper published today in Nature Climate Change, a “risk sensitive planning” strategy is needed to protect coastal cities, which are increasingly at risk because of climate change, subsidence and a growing population. The researchers looked at the 136 largest coastal cities in the world and found that cities in developing countries are particularly vulnerable to flood losses as they often lack resources for long term planning. “No city is doomed, but we have to expect huge disasters in the future. And better international coordination to provide support for the affected countries is really important,” says Stephane Hallegatte, senior economist at the Sustainable Development Network of the World Bank and lead author of the study. Among the top 20 cities with highest relative losses in proportion to their gross domestic product in 2005, only three are located in developed countries. The list is topped by cities such as Guangzhou in China, Guayaquil in Ecuador, Ho Chi Minh City in Vietnam, Abidjan in the Ivory Coast, Zhanjiang in China and Mumbai in India. Coastal city flooding image via Shutterstock. The Alaskan village set to disappear under water in a decade. Hardtalk, BBC News.